Spending a summer working for Glacier Park Inc is the way to go in terms of finding seasonal jobs abroad, summer jobs, or simply investigating Montana employment opportunities. But first, let’s make sure you’re up for this. Are you prepared to awake and fall asleep in paradise for three months? To spend your mornings hiking the trails that traverse Glacier National Park, your days waiting tables or helping tourists in camp stores, and your evenings sipping on a chilled Moosedrool (Big Sky Brewery’s brown ale) around a campfire? Are you prepared for a few months of paradise that will forever change your life? If you answered yes, then read on. Have you spent a summer working in a National Park? Working in Glacier National Park is an experience unlike any other. My summers in the park are my dearest memories. Though I could have spent my time like my fellow peers, whittling away at internships to prepare them for the career world, I wouldn’t exchange my time for any amount of money in the world. Who Works for Glacier Park Inc? Anyone. Any age, from any background, with any baggage. While I was working in Glacier National Park, the youngest person who worked at Lake McDonald Lodge was 18 while the oldest was 72! While the majority of employees were in their mid-20s, there was a substantial crowd of recently retired baby-boomers who formed their own tight-knit community. Glacier Park Inc, which owns Lake McDonald Lodge, Many Glacier Hotel, Rising Sun and Swiftcurrent Inn, also employs foreign workers who nabbed a seasonal job abroad. Many of my co-workers were from Russia, a handful from Croatia, and a good friend I made was from Brazil… the list goes on. Teachers spent their summer break working in paradise and retirees cherished every sun rise. The bottom line is, you’re never too old or too young, too rich or too poor, too city or too country for a seasonal job in Montana’s Glacier National Park. Are there options besides Glacier Park Inc? There are tons of locations to work in Glacier National Park. However, one great aspect of Glacier Park Inc is that they offer many seasonal employment opportunities, from working in fine dining, to serving pizza at Jammer Joe’s, to the cash register in gift shops, to maintenance, to driving the wonderful, firetruck red Jammer busses. Additionally, GPI offers housing for their employees as well, for a nominal fee, of course. More important than offering meals, lodging, laundry and wonderful environments for their employees to work, the locations Glacier Park Inc owns are among the most beautiful in Glacier National Park. Feel free to visit Glacier Park Inc for more information. Enough already. Where else would you recommend working? When I return for another season of employment in Glacier National Park, I plan to work for the Park Café. Located in St. Mary, Montana, just outside the east entrance of Glacier National Park, the Park Café and Grocery bakes perhaps the best pies I’ve ever eaten—all homemade, of course. Even though it’s slightly outside the park, Going to the Sun Road is only a skip away and so are dozens of hiking trails and backpacking opportunities (plus, the mountain views rival any GPI location). Bottom line, The Park Café and Grocery is a hip, wonderful little joint. Regardless of whether or not you want to work there, no Glacier National Park vacation is complete without stopping at The Park Café after a day hike or backpacking expedition. Chow down on a scrumptious meal, topped off with savoring a slice of the world’s best strawberry rhubarb pie, while watching the sunset behind the mountains. Take a gander at The Park Café’s website. Like Glacier Park Inc, the Park Café offers reasonable housing accommodations for their employees. Nobody can deny Glacier National Park’s remoteness. Even though companies like Glacier Park Inc. provide computers and internet access, the connection is slow and long lines of employees take up the computers at all hours. Additionally, cell phone reception is terrible. Using a payphone and a calling card is the only way to keep in touch with family and friends. I have two years of experience working for Glacier and have made countless friendships through the years that continue on today. 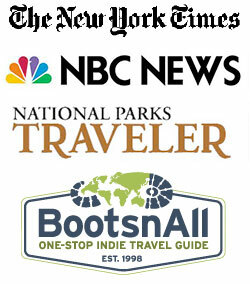 Planning to work at Glacier National Park? Don’t forget to sign up for The Growing Glacier Newsletter. Only delivered twice a month so it will never clutter your inbox, the Newsletter offers tips & advice for future employees and visitors to Glacier that is otherwise unavailable on the Glacier National Park Travel Guide. Want to learn more about seasonal summer jobs and employment in Montana’s Glacier National Park? Or just more about seasonal employment abroad or in the states? It’s the website I initially found my job at and they have a wonderful message board community to answer all questions you might have about Glacier Park Inc and other seasonal employment opportunities.